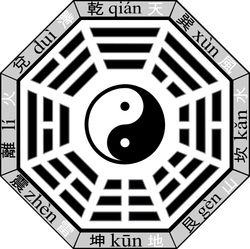 The fundamental trigrams (and hexagrams) are built from the bottom line up. The bottom line represents earth. The middle line represents humankind, and the top line represents heaven. Each trigram represents the fundamental principles of reality, and expresses patterns of movement and change. Each consists of three lines, "broken -- " line represent yin, and "unbroken — " line represent yang. The trigrams are associated with a host of natural and human phenomena; the seasons, the time of day, magnetic directions, the five phases and their corresponding colours, animals, human personality types, body parts, related illness and numbers. named lesser yin, great yin (taiyin also means the Moon), lesser yang, great yang (taiyang also means the Sun). eight eights are sixty-four hexagrams.